New weekend - great shows - more fun! While The Real McKenzies are still on the road The Adicts are finishing their tour - and tomorrow both will be at the Rock Your Brain Fest in Selestat, France. Another bunch of our great bands, Idle Class (on Friday) and Atlas Losing Grip (on Saturday), are going to play at RIEZ OPEN AIR in Bausendorf. The Offenders and NH3 SKA/CORE hit the stage tomorrow (26.07) in Augsburg @ Copa Augusta. Great couple - you don't want to miss this! And finally Los Fastidios are on their way to play at Umsonst & Draussen Lindau with bands like Mad Caddies and Biohazard. Collect some friends, have a couple of beers and enjoy your weekend! 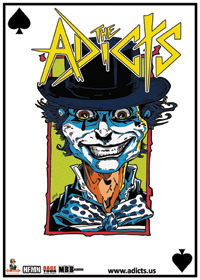 The Adicts are in town! Their van is prepared and ready for the road. This weekend is full of good music. Our bands are on their way to play in front of you. Some of them hit the stage in the Czech Republic to play at the "Might Sounds Festival". Other bands stay in Germany to play the "Horst Festival", "Fonsstock Festival" or at the "Volcano Festival". I'm pretty sure you will find something in your area! Fingers crossed for good and sunny weather! Have a couple of beers and enjoy some music! See you on the road! Cheers! For more infos, please check our tourdates - section! 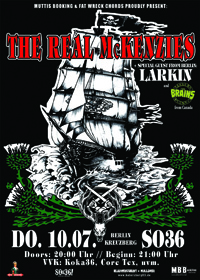 THE REAL McKENZIES on tour! On July 10th our vacation starts and The Real McKenzies will be in town! Forget your stress at work / school and have a great evening with us at the SO36. Supported by The Brains from Canada and Larkin Celtic Folkrock from Berlin we make sure you enjoy your free time with awesome music. If you are not in Berlin - don't worry. Early May we had LOS FASTIDIOS were germany in May for three days and here a good quality Livevideo for "Antifa Hooligans" recorded in Hamburg/ Berlin and Hannover! Regie & Schnitt: Mathias Söhn! Check it out, its really good quality and professionally filmed & cutted! On Saturday, October 25th LISA AND THE LIPS will hit the stage at the Rockpalast - Crossroads! Together with bands like "We Invented To Paris", "The Smith Street Band" and "Baby in Vain". So don't miss this awesome show! Tickets will be on sale soon! More toudates of LISA AND THE LIPS will be announced very soon! So stay tune for more!